Wash okra and wipe with a cloth. Take an okra and cut the top portion and slit vertically keeping the okra intact. Similarly cut all the okras and keep them aside. Wash and finely chop coriander leaves. Heat a pan and add 1Tbsp oil and heat oil. When oil is hot add carom seeds and allow them to fry for few seconds. Then add finely chopped green chilies and fry stirring till they turn slightly crispy. Then add finely chopped coriander leaves and fry stirring till they wilt slightly. Then add gram flour and mix and fry stirring till it starts leaving the pan. 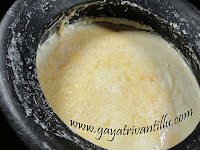 Break the lumps of gram flour formed with the back of ladle and fry. When done frying gram flour add dried mango powder and salt and mix well. Transfer the prepared stuffing mixture to a plate and spread to cool. Take an okra and stuff the prepared mixture into the slit. Similarly stuff all the okras with the stuffing mixture. Heat a pan and add 2Tbsps oil and heat oil. When oil is hot add the stuffed okras carefully. Try to arrange the okras in a single layer if possible. Cover the pan with lid and cook okras on medium flame stirring in between. When okras appear tender and cooked then remove lid and fry stirring in between. When okras turn crisp then switch off flame. 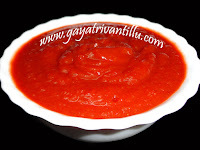 Transfer the prepared Bhendi Jaipuri to a serving bowl and serve hot with hot plain rice. This dish can also be served as a starter. Take tender and small sized okras to make Bhendi Jaipuri. Remember to finely chop green chilies and fry them in oil till they turn crisp so that they do not taste hot instead release their flavor into the oil. Carom seeds give a special taste to this dish. Always serve this dish hot. Stuff the okras with prepared stuffing and start frying them just before serving so that they remain crisp and taste better. This is a simple dish can be made easily and tastes excellent. Serve this dish with rice or roti or just as a starter.